New poll shows right-religious bloc rising to 68 seats, leaving left with 52. 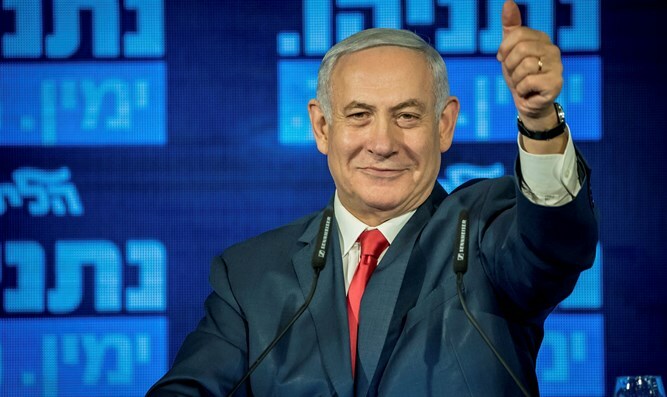 A poll by i24News and Israel Hayom gave the right-religious bloc a strong majority of 68 seats versus the Left's 52 - but also showed the center-left Blue and White party regaining its position as largest party. According to the poll, conducted by the Maagar Mochot research institutions and released Friday, Blue and White would receive 32 Knesset seats, with Likud trailing behind at 28. The new poll nearly parallels a Yediot Aharonot poll released the same day, which gave Blue and White 31 seats and Likud 27. However, the Yediot Aharonot poll gave the right-wing bloc 64 seats and the left-wing bloc 56. According to the Israel Hayom poll, the left-wing Labor party remains third-largest, but registers a drop to 8 Knesset seats. Seven parties would receive six seats each: the New Right, United Right, left-wing Meretz, Arab Ta'al-Hadash, Moshe Feiglin's Zehut, Asheknazic-haredi UTJ, and Sefardic-haredi Shas. Finance Minister Moshe Kahlon's Kulanu party and former Defense Minister Avigdor Liberman's Yisrael Beytenu would receive five seats each. This would give Netanyahu a coalition of 62 Knesset seats without the Zehut party, and 68 seats with it. The poll also showed that 50% of Israelis believe or strongly believe that US President Donald Trump's recognition of the Golan Heights as Israeli territory is an achievement of Israeli Prime Minister Binyamin Netanyahu. When asked who the most suitable candidate for prime minister is, 46% of respondents named Netanyahu, while just 36% named Blue and White leader Benny Gantz. Twenty-nine percent of respondents said Israel's economy is them most important issue to them, while 28% said the most important issue is security. Only 10% were interested in corruption issues.